For preppers, survivalists and others desiring to have other means of electricity when the grid goes down, solar has always been a valid means of off-grid power. 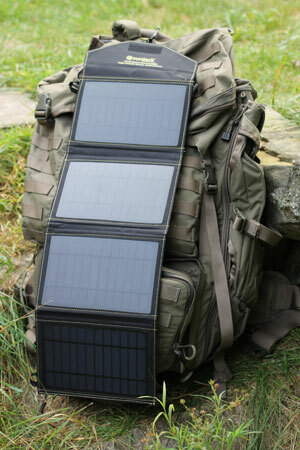 And in recent years, there’s been significant advances and interest in portable solar chargers that are capable of charging cellphones, tablets and other small electronics while in an emergency, on the go, bugging out, or any other reason that would require you to power and charge your devices when the grid is not available. 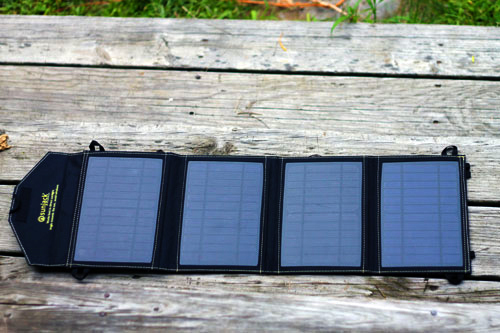 Well, I recently got my hands on a fantastic little portable solar-panel array that is perfect for small electronics like your Android, iPhone/iPad or anything else able to charge up from a USB port. 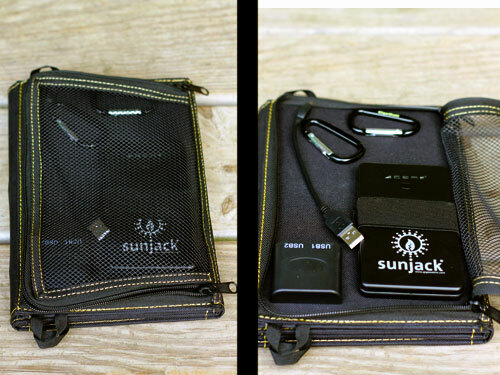 The 14 watt SunJack is a portable solar array made up of four solar panels organized in a black cloth foldable case. Overall it seems to be a very durable and well-made product. The battery, charging cable, and USB ports are located in a mesh bag behind the charger. The solar array has two USB ports which (when in full sun) will each produce an output of 2 amps. This allows you to easily charge a smartphone, an iPad, or other tablet requiring 2 amps to charge its internal battery directly from the sun. It also comes with an external battery (that will connect to one of the USB ports on the array) to hold the energy harnessed by the sun — providing you with a source of power to charge your electronics when the sun is down. In direct sunlight, it will fully charge the 8000mAh lithium polymer battery in around five hours with this 14 watt SunJack model (the manufacturer also sells a 20-watt version that comes with two batteries). When the battery is at full capacity (again, after only 5 hours) it has enough power to charge an iPhone around 4-5 times. When I first received this, the battery was already around 1/2 full so I couldn’t test the 5 hour charge time stated by the manufacturer. But after putting it in the direct sun (it was slightly cloudy that day) it took just under 3 hours to bring it to a full charge. From just this initial test I’d say they’re probably pretty accurate. There are other folding solar panel chargers similar to the SunJack on the market that I’ve seen on Amazon, but from reviews I’ve read they don’t have the “wall-speed” charging abilities. In other words, they take a long time to charge up your phone or worse, your tablet compared to charging it from a standard wall outlet — barely making a dent after hours of charging. How does the SunJack fare? To test this, I timed how long it took to charge two of my devices (an iPad and an iPhone) directly from the fully charged battery. Basically for both tests of each device I started at 40% for the iPad and 60% charge for the iPhone and charged each of them 40% more — first on the SunJack battery and then in the wall (after discharging the iPad and iPhone to 40% and 60% respectively). In both cases I did not see any significant difference between charging on the wall or from the SunJack battery. So again, it lives up to its promises by delivering “wall-speed” charging time. One other thing that I really liked was the durability of this device. In addition to durability, the SunJack promises longevity. According to the manufacturer, the monocrystalline solar cells will still produce 80% of their power even after 25 years of use and the the lithium-polymer battery holds roughly 80% of it’s capacity after 1,000 cycles. Assuming this is true (I couldn’t test this for obvious reasons) this is great news for us preppers who want products that can last not only through abuse (see the durability section above) but through the duration of a long-term collapse situation. 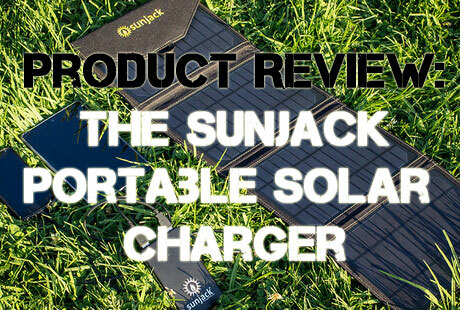 And keep in mind, if it’s as long-lasting as they say it is, the SunJack will probably outlast any device you plan to charge with it anyways. Currently the SunJack 14 watt that I have goes for $150.00 on Amazon. They also have a 20 watt version that goes for $250. For my uses, the 14 watt is plenty. The one feature I would like to have seen in this is that it were weather/waterproof. I’m not necessarily saying it needs to be submersible, but more so that it would hold up in a decent rain. Their weatherproof sleeve is specially designed to maximize sunlight pass-through while protecting against the elements. 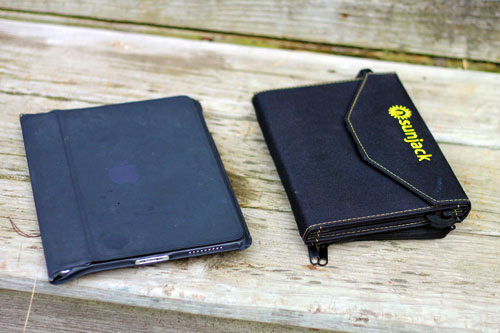 The SunJack is ideal for preppers who want to have portable power available for small gadgets such as smartphones and tablets. I’ve also been able to successfully charge some Ni-MH batteries with a AA USB charger I have which is what I need to keep a small 2-way HAM radio going that I have. Yes, this was for the full-sized iPad that I have. Great Info Thank You 🙂 Love Your Site! Generally speaking, dentists recommend that you brush your teeth at least twice a day. The requirements for a cosmetic dentist are actually the same with that of a general dental professional. they would like to whiten or bleach them. to find this matter to be really something that I think I’d never understand. 3D modeling for geologists is often done with all the Environmental Visualization System (EVS) and also the Mining Visualization System (MVS). caked around your temples, as an example, then it’s likely you’ll need more salt).